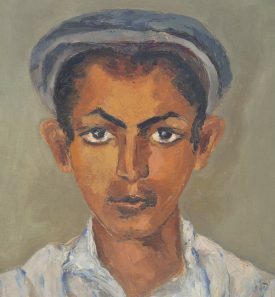 An exhibition at the Negev Museum of Art of works by Anna Ticho, one of Israel’s greatest artists, is a special event, partly because her oeuvre is not often displayed. 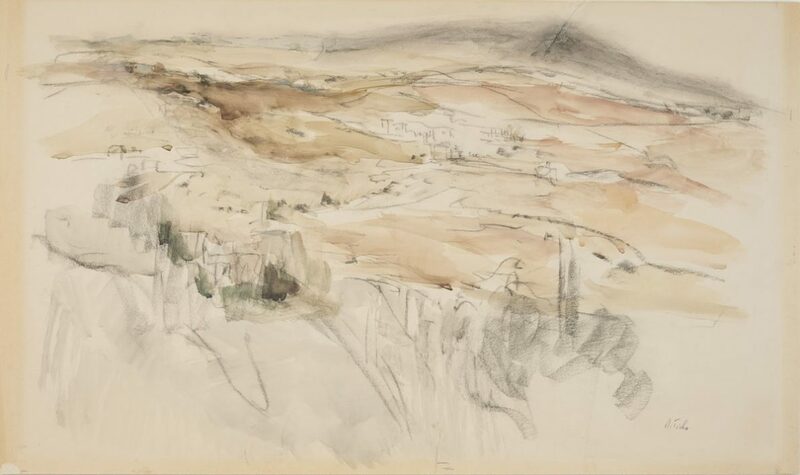 Anna Ticho (1894-1980) is identified above all with Jerusalem, where she lived, and with its landscapes which she captured in her artwork. 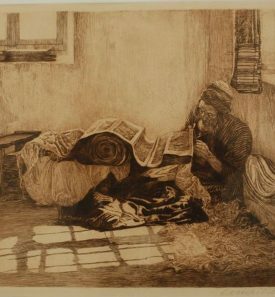 Exhibitions of her works were generally held in Jerusalem, and after her death, chiefly at Ticho House and the Israel Museum, Jerusalem which has just published the first research book on her art. This exhibition was made possible by the generous loan of works from the collection of the Engel Gallery, whose founder, Shmuel Engel, was friendly with Anna Ticho, worked with her and was a frequent visitor to her studio. Before Anna Ticho immigrated to Palestine in 1912, aged 18, she had spent years studying art in Vienna, where she grew up and was educated. She accompanied her cousin, Dr. Albert Ticho, an ophthalmologist who became renowned. 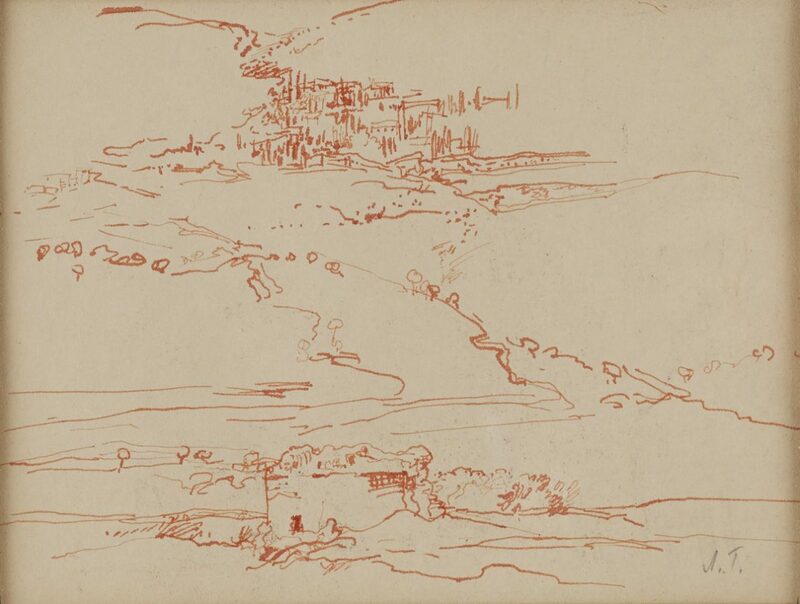 Later, the two married, settled in Jerusalem, and opened an ophthalmology clinic where Anna worked as a nurse while also devoting her time to art. 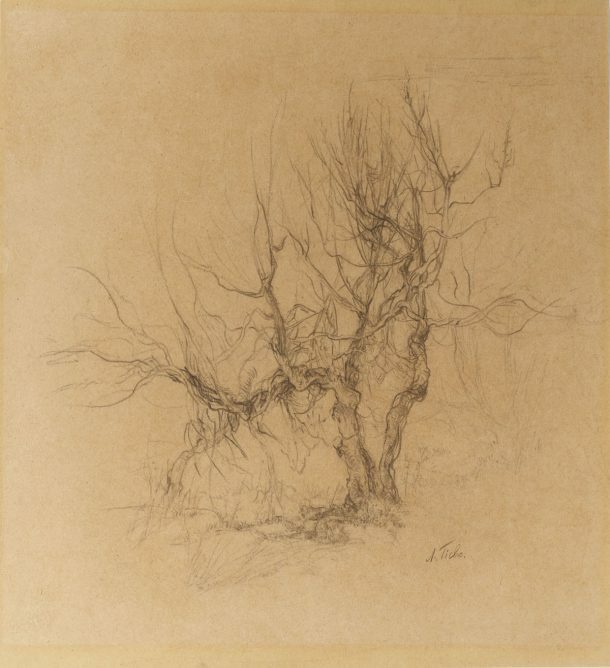 Working in pencil, charcoal, ink and watercolours, she created landscapes and figures, trees and flowers. Over the years her style and approach to drawing underwent several changes. After her husband’s death in 1960, Anna Ticho devoted herself to art full-time. In the 1970s, her drawings became abstract and freer; they were executed in the studio on large sheets of paper, usually from memory. 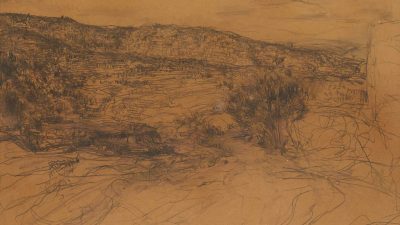 Her portrayals of landscapes of the Judean Hills and Jerusalem led Ticho to be totally identified with landscape art. She also created numerous drawings of Jerusalem characters, Jews and Arabs, including people who attended the clinic. 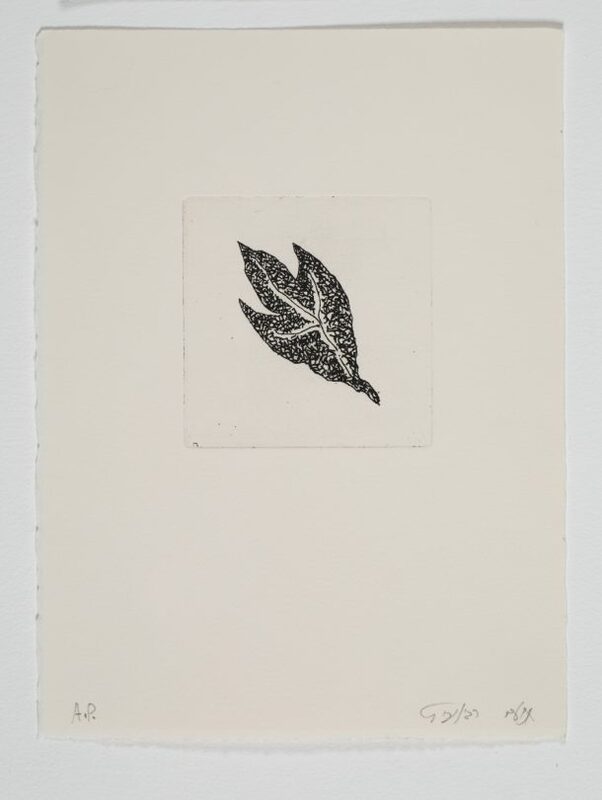 The works in this exhibition are a very small selection from Anna Ticho’s extensive body of works, which span decades, and they are grouped by theme. 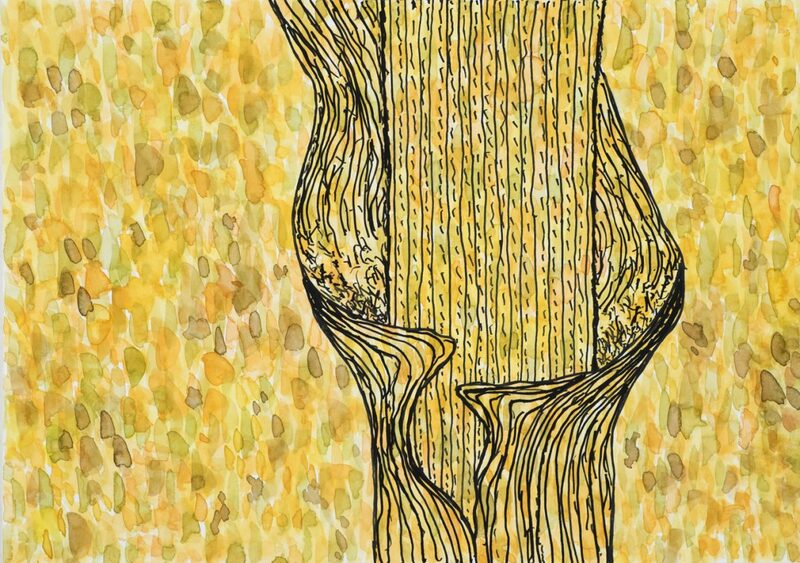 Viewers can gain an impression, through comparison, of the various ways in which Ticho chose to translate the space or details in a landscape onto paper. 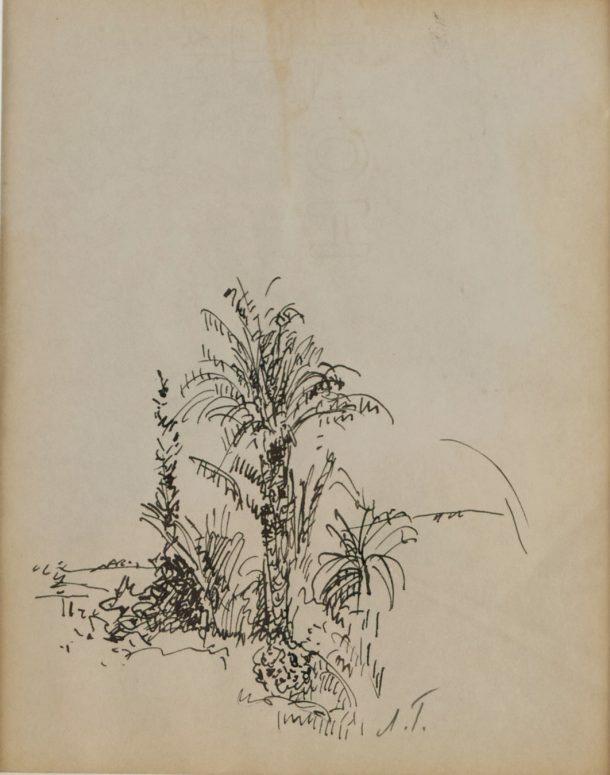 Her techniques included using a thin, delicate line or a broad sweeping line and smearing a patch, a densely detailed sketch, or freely marking outlines in an essentially naturalistic and informative style, as compared with expressive, imagination-fuelled drawing. Notable in her drawings of figures is the varying emphasis placed on expressions, body position, skull structure, and the role of white paper as background – or as part of the image itself. In the flower drawings, it is interesting to notice the location of the free patch of colour separately from the line. 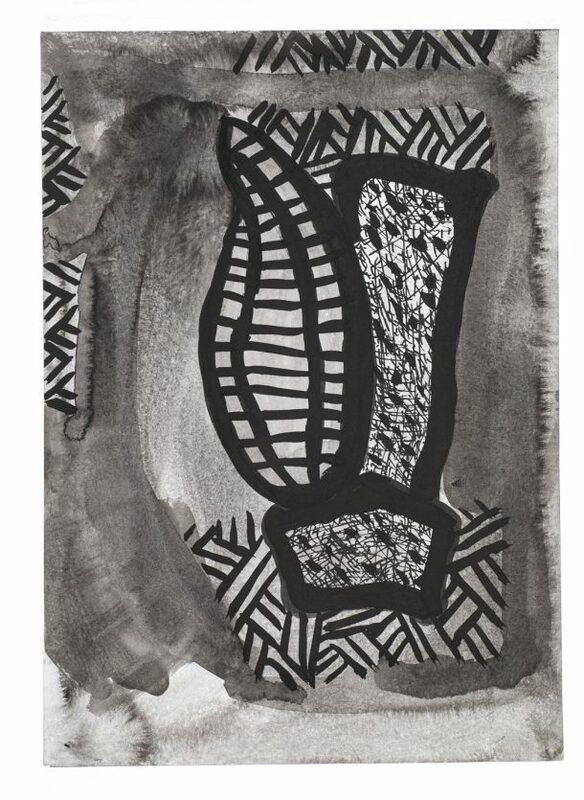 The encounter with Anna Ticho’s drawings, even in the limited selection shown here, reveals a wealth of methods, perspectives, and personal interpretations of the motifs she engaged with, and offers an opportunity to study this tremendous artist’s distinctive handwriting. The initiative for the exhibition by Noam Rabinovich at the Negev Museum of Art was an unusual step: sowing wheat in autumn 2015 in the museum’s grounds, a project envisaged and executed by the artist. At that point Rabinovich (b. 1950), who lives and works in Kibbutz Beit Hashita in the Harod Valley, did not know how that move would develop. The museum’s staff, who had tended the wheat for several months until its harvesting, had no idea either. For Rabinovich, it wasn’t an exceptional project: sowing seeds, and planting trees and plants are essential aspects of his artistic outlook – the drive to grow and be inspired through a continual observation process. Wheat is not just a plant, but also culture, myths, and visual images. In antiquity, wheat was the main food ingredient in the Mediterranean region. It is frequently cited in the Hebrew Bible and is one of the Seven Species with which the Land of Israel is blessed. 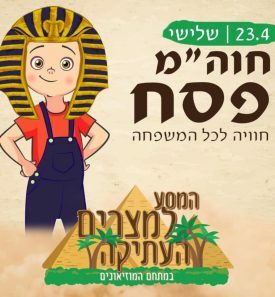 Today most wheat in Israel is grown in the Negev. In 1906, Aaron Aaronsohn, the agronomist and botanist of the Land of Israel, discovered wild wheat in the Upper Galilee and proved the connection between wild wheat (‘emmer wheat’) and cultured wheat. He also tried to hybridize the two, pioneering the central approach applied in modern agricultural research. Prominent among the varied techniques that Rabinovich uses is embroidery, a painstaking handwork that imbues his drawings and paintings with layered materiality. The stone sculptures on display evoke his renowned early works – stone and iron sculptures from the 1980s. 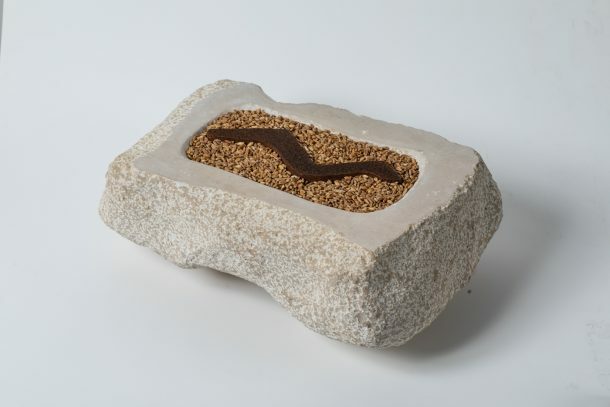 Adding wheat grains connects the quasi-ritualistic object with tangible reality, the object of his observations in recent years. Closing the exhibition are works which have no tangible reality. In his ‘Running Sketches’ series, the artist performs all drawings in the series on one sheet; each drawing is erased and redrawn, and so on. Before being erased, the drawings are scanned and become digital files that accumulate in a video, preserving the sense of passing time, and the actions that were performed. 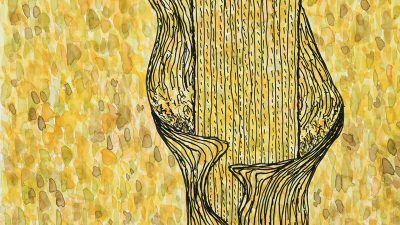 Visitors are invited, as if through the artist’s eyes, to observe the paintings, and the wheat flourishing in the museum’s grounds in the Negev and the courtyard of his studio in Beit Hashita, as it grew there thousands of years ago. What has happened? When and where? 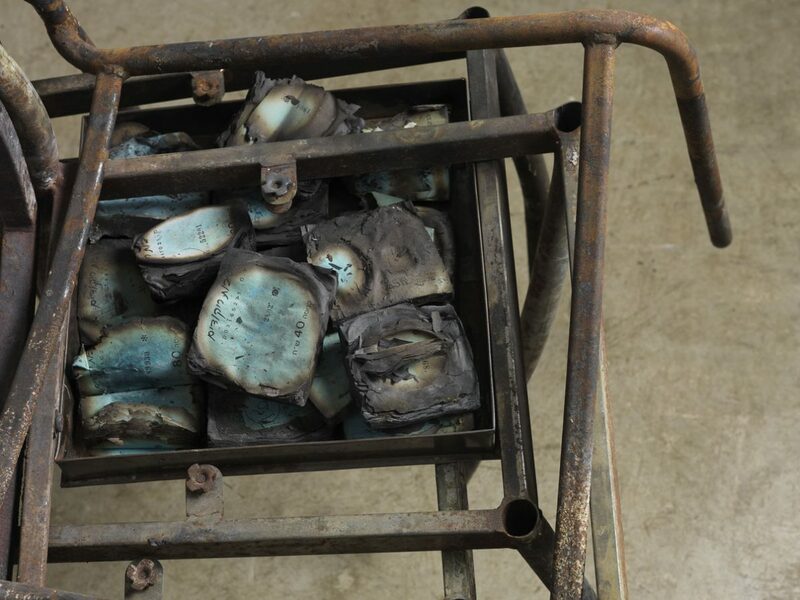 Past events and memory play an important role in Doris Arkin's work, serving as raw materials for her sculpture. The objects the sculptures are constructed from function as carriers of material, historical, and cultural information. 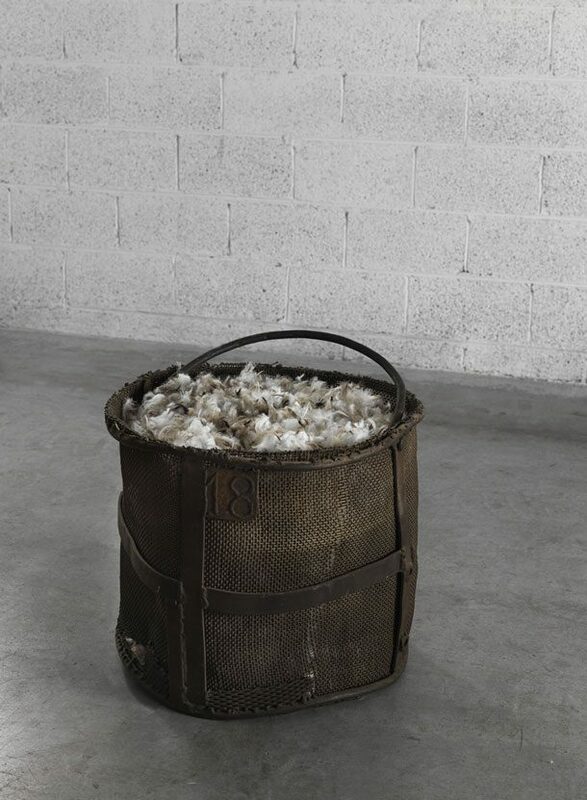 Even at first glance, before we delve into associations of times and places, the works’ physical dimension is evident, emphasized by opposites: industrial versus hand-made, black vs. white, the containers and the void within them, the world of industry vs. the intimacy of the home. 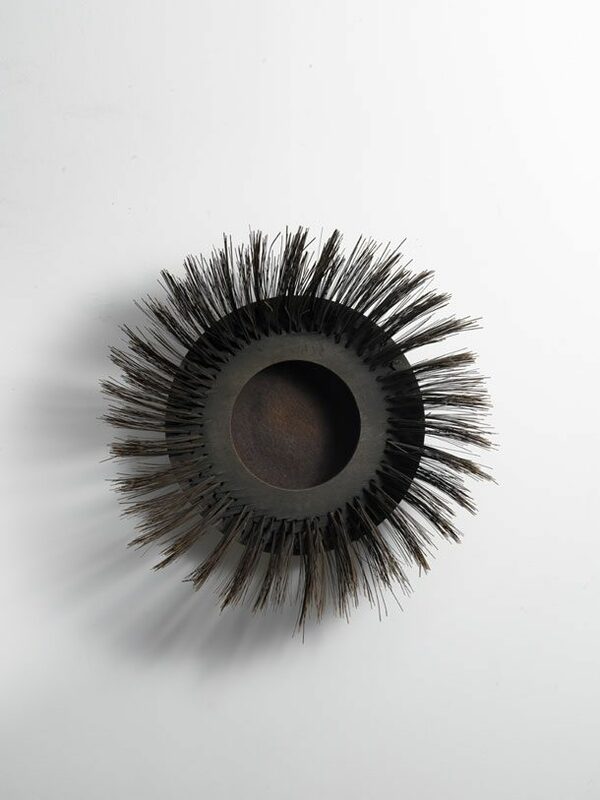 Gender associations also emerge in the context the objects Arkin combines in her assemblages.At the foundation of Arkin’s artistic approach is the found object (objet trouvé, in French). It is defined as a manufactured or naturally available item (or a part of it) which has been used as raw material in an artwork. This art form developed in the first third of the twentieth century among Dada and surrealist artists. As they combined various objects, with different functionalities and characteristics, they created new, poetic objects that defied concepts and categories. 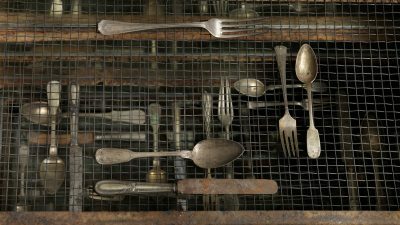 In the 1960s, the use of found objects re-emerged and was expanded by artists from European movements such as Fluxus, New Realism, and Arte Provera, and also by the Young British Artists in the 1990s. Found-object-based art inevitably assumes the object’s identity and story, as well as its place in history and in society, as part of the artistic meaning conveyed by the new work. The objects Arkin selects, which are the starting points of her works, usually possess an abstract geometrical shape – a cube, a cylinder – and are often made of metal, like minimalistic ready-made sculptures. The fact that these objects have been thrown away and survived disasters helps Arkin to create works that evoke pain, loss, and death. 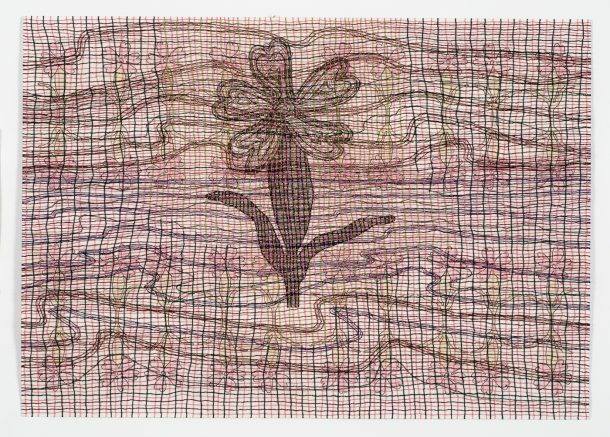 To the industrial equipment she has found in various places, Arkin adds a resonance of a lost elegant, bourgeois world, in a laborious process of investigating, searching and finding, and stitching together delicate bits of fine textiles. 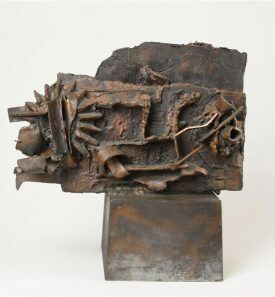 Her work is nourished also by items with a personal significance: the family’s old silverware (in “Festive meal”); the number 18 – the age of induction into the military in Israel – found on a basin for tempering metal (“Plucking”); and the deep, shocked impression left in her upon hearing the testimonies of young women, survivors of the genocide of the Yezidi people, concerning their continuing suffering (“Loot”). While the personal motivation remains hidden, the specifically detailed materials that make up the works suggest further directions of interpretation, from within the sensory and emotional experience. Doris Arkin, born in Uruguay in 1957, has turned to art studies relatively late in her life, after a twenty-year career as a psychologist. In the last five years she has been showing in various exhibitions, and this is her third solo show. Our thanks to the artist for loaning her works to the exhibition.